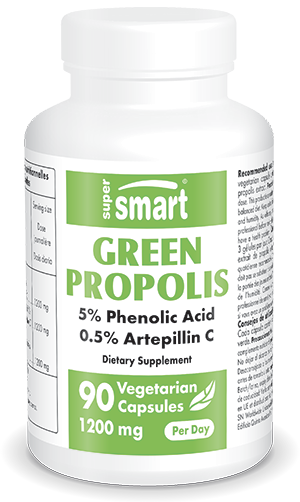 Green propolis is one of Nature’s riches. In traditional herbalism, it’s regarded as a valuable remedy for fighting all kinds of infection. Like honey, it boasts a highly-complex composition with amazing levels of biological elements. Its effects are thought to be due to the many polyphenols and phenolic acids it contains such as artepillin C, a molecule which in recent years has been the subject of numerous scientific studies. Propolis contains a number of antioxidant compounds which can ‘trap’ free radicals, the highly-aggressive reactive oxygen species which damage our health (in an effect termed ‘oxidative stress’) and which are key players in cellular ageing. The 40 or so flavonoids found in propolis make it, along with tea, one of the richest sources of antioxidants, comparable to Antioxidant Synergy or Reduced Glutathione. Scientists have also observed an effect against gastric ulceration (induced by indomethacin) due to its significant anti-secretory activity.